It was the first time I had ever attended a city council meeting--my neighbor Lou had asked me to accompany him so that I could give him my proxy as a Menlo Park resident to address the council for 3 minutes. Among two other neighbors and me, Lou would get the time he needed to present his objections to a new city council amendment--strongly advocated by the mayor--that permitted anyone to chop down a mature oak tree without permit or notification so long as it stood in a permitted building envelope. At the time I was hobbling around on crutches nursing a bad ankle sprain, but this seemed like a worthy, if futile, expedition to help Lou save our town's native trees. On the way out the door, my four-year-old son asked me where I was going. It was late at night, and he was already in his pajamas, but I thought, Hey, why not give the kid a civics lesson? "I'm going with Lou to a city council meeting, where neighbors we've elected make city laws. Do you want to join us?" Yes, he would. It was only a three minute ride to the council chambers, and along the way he asked why we were going. "The city council is thinking about whether it should be easier for people to knock down trees in order to make their homes bigger. What do you think?" When we arrived, Lou told me that he didn't need my son's proxy, since he had already reached the cap. I asked my son whether he would like to use his 3 minutes to share his views with the city council. He nodded yes, so I submitted his name on the roster. We didn't have any time to discuss what he might say! We sat through 45 minutes of rather boring administrative discussion, and finally reached the alloted time for public opinion. My son's name was the first one called. Was my four-year-old still awake enough to do this? Would he even speak? Did he actually remember why we were here tonight? If he did speak, he would likely just jabber on about the cool looking spotlights and big computer monitor. But I had promised him his chance, so I crutched up to the microphone with him by my side. "My son, a Menlo Park resident, would like to tell the Council why he opposes the new amendment on heritage trees." To the look of many surprised faces, I lifted the small boy up to the microphone, having no idea what he would actually say, if anything. But, sometimes children truly surprise. Without hesitation, he spoke a single sentence--delivered clearly and to the point. "I think we should save the trees because they make the air we breathe, they give us shade, they're beautiful to look at, and they're home for the animals." I set him on the ground, and he walked slowly beside me as I crutched my way back to our seats. I heard the first sound of clapping hands from somewhere in the audience but within just 2 or 3 seconds every person in that room joined in, including the city council members and mayor. We sat down amid a thundering applause--one tired little boy and the proudest father who ever lived. My neighbor Lou then delivered his presentation, but it was moot. My son had already chopped that amendment down with ten times the force of an excavator uprooting an oak. Turns out that he gave me the civics lesson! Update: I'm often amused that commenters to my blog challenge the veracity of my reports (e.g. see comments on these posts), as if I have any reason to hoodwink you. Fortunately, our local newspaper backed up this little anecdote of mine with a front page story on how Avery prevailed upon the council to repeal the amendment! Nice! Menlo Park was one of my company's first clients. You should submit your comments on this issue via their web site menlopark.org and click "Menlo Park Direct Connect" - that's our CRM system behind the scenes. I'm a mother of 3 kids and i have a four year old son too. I really enjoyed reading the story about your cute son and who's teaching who. Great, just great. I like the fact that your son didn't need to be coached, yet said it all so poetically. And a management lesson too? Stick to the point and say it in a single sentence. LOL - sometimes words of wisdom really do come from the mouths of children!!! A wonderful story, although I can't help but think only children and fools tell the truth without any agenda. As a former long time employee of local government, administrator of elections and all things council realted --- bravo, four year old citizen, what a fine Mayor you will make one day! But what was the outcome of the ammendment? That night, the council (including the mayor) unanimously repealed the amendment. Sometimes it isnt a matter of knowing more, but of being able to sort what you do know. There is great wisdom in simplicity, and by this, even in the very young. When I was a kid I was supposed to have said: "Death is the saddest part of life." I dont know that I could say it better today. David, that is really awesome! First of all, I'm impressed that you respected and trusted your son enough to let him speak. Second, you must be doing something right to have such a prescient four-year-old. Anyway, your story nearly brought me to tears. How simple things can be sometimes. New to blogging and even newer to your blog, I love your writing style. Awesome job with your son, in so many different ways. It does a body good to hear that there are actually some parents who aren't totally clueless. What is the outcome of the amendment? Awesome story, great writing and I love the name of your blog. Your son will make a great civil servant someday! Your post doesn't faze me at all. I say that not because I'm not impressed by your boy, quite the contrary, kudos to him! I wish all major companies & governments had 4 year olds on their board. That way the world would be so much better! Wow that's an amazing story. Sometimes you just need to get to the point and speak from your heart. This was definitely a refreshing story to read. This is just beautiful! My son just turned 5 yesterday and I hope he never loses what it is that makes children shine the way your son did that night. Thank you so much for sharing this! I live on the other side of the pond in the uk. I came across your blog by chance. Your article about your son is touching and it reminds me of a story of the son of a friend mine years ago when they were driving. Outside it was blowing a gale. The father said, "Wow it's a rough old day..." The 5 year old boy looked up from his comic at the trees swaying back and forth and said straight off, "...yes but at least the trees are dancing and drinking champagne." Who knows what goes on in the mind of a child... just as long as it does. It's a touching article about your son and in a world filled with grief it gives us hope. It also reminds me of something that the son of a friend of mine said when he was five years old.His father was driving the family somewhere here in the UK. The weather was stormy. The father looked at the trees being buffeted and lashed with rain and remarked, "It's a rough old day out there." The boy looked up from the book he had been reading to while away the journey and said, "...well at least the trees are dancing and drinking champagne..." You just wonder where it comes from don't you. Thank goodness though that it comes from somewhere. That was a terrific story. It made me smile because my husband would have done exactly the same thing you did that night - bringing your son to a meeting and letting him speak. One of the things I love the most about my husband is his respect for our children's thoughts and ideas. Your story is heart-warming...our children are so perfect and brilliant and honest. What a humbling privilege it is to be able to raise them! jz one thing..ur blog takes time to load... (lots of time!) No offence..anyway, with the great info here, u dun wan't to make readers feel unpatience waiting for ur blog to load up..anyway, keep it up!!! Take care..ciao!!! The blog loads nearly instantly on my end. I think I'm on a DSL connection. it really could not have been put into better or simpler or more accurate terms. Love this tale. Having been a principle officer with a local goverment office here in UK, I would doubt that our hardened elected members would give a smile or clap if somthing similar were to be allowed here. We do have a strict TPO - tree preservation orders- to stop the distruction of mature trees, just as well! Awesome! From the mouth of babes, we can learn so much. As a former resident of Menlo Park (after college) and lifetime lover of trees...hence the name of my own web log...and as the mother of a child now 6 who said at age 4 on January 1st 2004 at 8:02 pm (the remark stopped me in my tracks to take note) "Mommy, I don't know what love is, I just am." I simply add to the many acknowledgments. "Please don't step on the children" (once inspired a post to my web log...and oh to remember it is far better to lift them up to be heard first and always. Bravo to you for listening to the call to take your son where you choose to go. Simplicity, truth, and a kind heart. We need more of this in our world. Thank your son for his wisdom, and thank you for sharing a very special moment. one small query though ... is'nt hot linking images from another website frowned upon? Interesting, I had no clue that hot-linking defies the net ethic. I thought it was a net-friendly way to provide attribution and avoid duplicate storage (kinda like recycling). Do others agree I should stop hot-linking images? Somewhere in Portugal, somehow, someone entirely agrees with your son. Without the trees, what would we be in the future? Some kind o f strange creatures struggling to survive with masks an no pure air. We are always learning from children. Sometimes they are the real teachers for adults. Well, I loved this blurb. i have no clue what hot linking is!! but hey how many non tech folks do? Hotlinking is generally frowned upon because it's basically 'stealing' a person's bandwidth. Hey, I got introduced to blogging this weekend. Logged in today morning to see the response to my page and happened to chance your page coz of the name you have given it :-) Good One! Doesn't it make you feel GOOD to know you've been teaching them right!? What a smart little guy! Doesn't it feel good to know that they're actually internalizing the values we're teaching them?! Good for him for speaking up! I am a mother of one she is 3 i am 17 and everything you said ment absoultly nothing. But would you listin if i told you that CHILDREN LEARN FROM THE MUSIC THEY LISTEN TOO? BOOKS SAY THINGS IN DIFFERNT WAYS, MUSIC MAKES THE CHILD FEEL WHAT IS MENT TO BE SAID AND THEY CAN TELL HOW IT IS MENT WITH THE ATITUDE. I thought you mite like to know my two centce. Very few parents take the time to teach their children anymore. They just shove nintindog in their hands and ignore them. So, those who don't sherk their responsibility to teach their children are special people. However, those who really help their children learn by letting them participate like that... well, it's rare and admirable. He will be a credit to our future generations, no doubt, by getting a healthy start. It infuriates me to see people neglect their responsibility and opportunity to teach their children. I can't have children, apparently, so I am especially agrivated to miss that opportunity knowing that those who have it usually take it for granted. I have raised children, to an extent (helping my sister out - long story), and I've seen how taking the time to teach can make a difference. Hi, I am from India, just browsed your blog recently. I must say 'a unique paroxysm of feelings may be felicitating in you mind while walking with your wise son.' Hey, you are a proud father and your child's innocense was awesome furnished with exuberant thoughts. Gives us all hope for the future of this fragile planet. Well done from Australia! 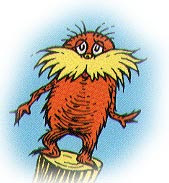 Is that the Lorax? who speaks for the trees? Whoever posted "anonymously" needs to learn how to spell! I have little respect for someone who rants like that, and even less for those who communicate their rants poorly. Anyway...that is a great story! Your son really communicated the essence of the argument with just one sentence! Good for him...two thumbs up! BTW, I read you profile: isn't "Jewish atheist" an oxymoron? I was just wondering, did you know that "a child shall lead them" comes from the bible, Isaiah 11:6? You might not care -I just found it interesting. I stumbled across it the other day. I didn't know either and have used that phrase my whole life. I just happened to be looking at your info on elevator speeches. Your son gave the best example. Good title as can learn a lot from our children. They have no agendas and everything they say comes from the heart.